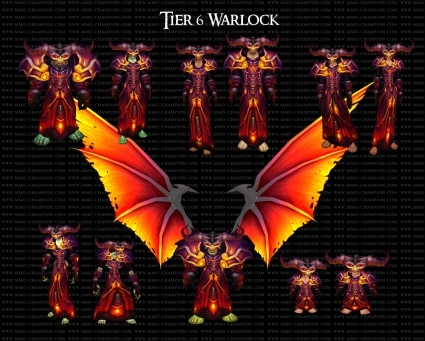 Perhaps the most polarizing set amongst all classes, the Malefic set makes up for an average set of shoulders with massive and animated demon wings that spread at random. Additionally, this very demonic looking set is augmented by a strange but Warlock friendly helm complete with over sized and goat-like horns. Some call this set silly, others the peak of Blizzard’s artistic style. Personally I call this set hellish and would wear it immediately with pride… if it were not obsolete. This entry was posted on August 4, 2011 at 10:35 pm and is filed under General, MMO, Podcast, Raiding, Role Playing, World of Warcraft. You can follow any responses to this entry through the RSS 2.0 feed. You can leave a response, or trackback from your own site.